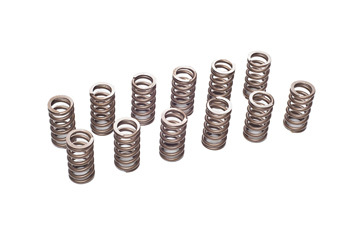 Our VAC High Performance BMW Valve Springs are a dual-spring interference design, made from H-11 Alloy (a metal often used for highly stressed structural parts such as aircraft landing gear). Offers excellent stress resistance, as well as resistance too thermal fatigue. Each one of our M30 springs is shot-peened for stress relief and utilizes a dual-interference fit to control harmonic resonance across the rev range. In our dual-spring configuration, should something happen to one spring, the other can prevent the valve from dropping and causing catastrophic engine damage. With precise specs and consistent quality, these springs are capable of burst revving to 12,000 RPM for the added peace of mind on the race track and maximum performance street cars. We have been using our VAC series of springs in our World Challenge Touring Car, GT3 car, C-Mod E36 'Silver bullet', and thousands of race engines for years with nothing but excellent results! Designed with the aid of a Formula-1 engineer; our springs are guaranteed to out perform the competitions valve springs at any price.